This pattern contains only 28 pieces and has been designed as a first copper foil or lead came project. 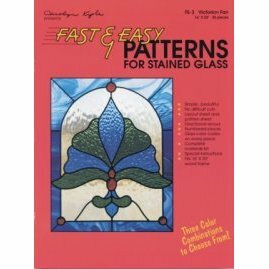 It can also be a fast beautiful project for the experienced stained glass hobbyist. This panel will fit a standard 16" X 20" wood frame. However, the panel should be measured before either ordering a ready made frame or making one from wood stock.